The heavy up-tick in digital video options along with the introduction of smartphones and tablets has given consumers something they never had before with traditional television – a choice. YouTube alone boasts nearly 1 billion monthly unique visitors to their site chalking up over 6 billion hours of video watched each month — that’s almost an hour for every person on Earth. The introduction of mobile devices powerful enough to stream HD and 4K video has only fueled the growth to double-digit multiples. 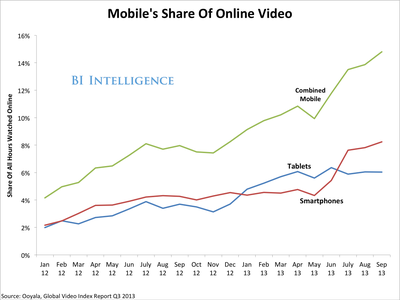 Close to 40% of YouTube consumption now comes from mobile, according to a recent BI Intelligence study. Plus, an explosion in smartphone and tablet sales, along with the increase in availability of bandwidth has led to more time spent consuming video on mobile devices. According to eMarketer, consumers are currently spending 33 minutes per day consuming mobile video and that number is set to grow by 50% in 2014.With no slowdown in site, there’s no doubt that the opportunity for content creators, distributors and advertisers is greater than it’s ever been. When Do You Check Your Smartphone? According to research from Toluna, US smartphone users are actually laggards in the morning, and relatively casual about checking their phones at night, compared with smartphone users in several other developed internet markets. Toluna found that just under two-thirds of US smartphone users looked at their devices within 15 minutes of waking up, and a similar number did so within 15 minutes of going to bed. But users in the UK, France, Germany and Singapore were much faster about their morning check-ins, and those in France, Germany and Singapore were also more likely to check last thing at night. Yahoo has released some of the data captured by its Android homescreen app Aviate, revealing how app usage differs across the day. Among the findings was the news that, while the average Aviate user has 95 apps installed on their phone, only an average of 35 will be used throughout the day. The data also showed that phone and SMS apps are mostly used during work hours, while media and video apps rise steadily throughout the day, peaking at 10PM.